Sally’s SME journey started when she was at rock bottom. In an all-too familiar story, a recent divorcee named Salena Ahmad, or Sally realised that she would be alone in caring for her two children. At that time all she had to her name was what she would call a “soured business”, and no source of income. Initially, she thought that she was alone in her woes but as she soon discovered, her community in Sg. Udang, Klang itself had 75 unemployed mothers. Her situation unfortunately is a dime a dozen. According to the Women, Family and Community Development Ministry, there was a total of 235,240 women categorised as single mothers in Malaysia and many among those numbers find themselves in need of aid. In a traditional family structure, single-parenthood can be a huge blow to mothers who now have to juggle between childcare and work to provide for their family. This was a struggle that Sally was all too familiar with at the time. In an effort to change the tide of her life, she joined a jeans upcycling course that was the catalyst to the SME that is now known as SURI. SURI sets out to provide flexible employment opportunities for those single mothers. Some of the products provided by SURI. The 12 beneficiaries in SURI out of the 75 single mothers in the Sg. 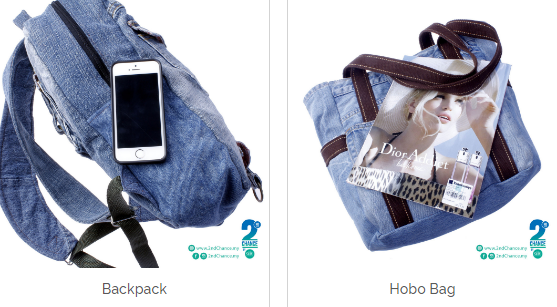 Udang area are in the business of stitching together upcycled denim into handcrafted bags. The resulting business from SURI that sells these bags was christened 2nd Chance by Sally, named so for what it represents. 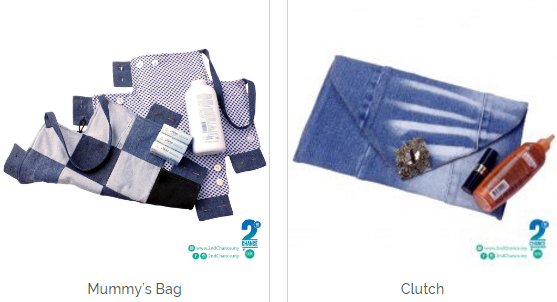 The business is a second chance for Sally, for the benefiting single mothers, and also for the jeans that finds new life in the form of denim bags. At the end of the day, no matter what a product may represent, the hard truth is that people look for aesthetics, as well as quality. To that end, on top of their usual array of 7 items listed up in their collection, Sally is putting in special focus on her ‘Premium’ items, listed under her Made-to-order section. Here, Sally states that there is emphasis on clutches with interesting accessories attached to provide the products with a signature look. Sally currently has 13 years of experience in the business industry, and another 10 years working with NGOs. But as Sally said, in the beginning of her journey, she had no idea how to run an business all by herself. But the MaGIC accelerator programme does require a full-time commitment, and in the beginning this proved too taxing on Sally who was going at it alone at the time. At the time, Sally’s son Amer Asyraf was in his final year at the Malaysia Institute of Aviation Technology. She did not realise how taxing dividing his time between his studies and SURI would be and it seemed like Amer was not keen on letting his mother down. Finally, Amer decided to defer his studies. The news came as a shock to Sally, seeing as Amer did not inform her of his decision before applying for his deferment. And seeing as he is a MARA scholarship recipient, this decision became a bit more complicated as he would have to apply for deferment separately from MARA. When asked about his decision, Amer said that he “didn’t have the heart to watch his mother do it all alone”. “At the time, I wanted him to complete his studies. I told him that if he couldn’t do it, he should have told me earlier. I won’t force him to do favours for me,” his mother said. But Amer insisted that he wanted to help her complete MaGIC, and will continue his studies after. As a mother, Sally felt guilty about her son’s decision, but the deed was done. And Amer Asyraf is now listed as one of SURI’s co-founders, responsible for the Social Media element of SURI, among other roles. He eventually kept true to his word, and will continue his aviation-related studies in February this year. 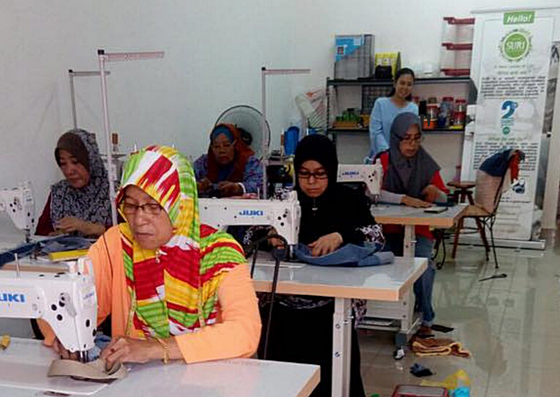 Today, SURI has received a grant of RM50,000 from Yayasan Inovasi Malaysia, was given 3 heavy duty industrial sewing machines by MRCB, RM5,000 from Sovereign Insight Sdn Bhd, and has generated income from well-known organisations such as Mydin and Petrosains. Seeing all of their success, and following in the usual SME footsteps of partaking in charitable acts, SURI gives back to the community for all that she has today by launching the Green Jeans campaign, aiming to collect used denim for upcycling. On top of that, SURI has a School Bags project. 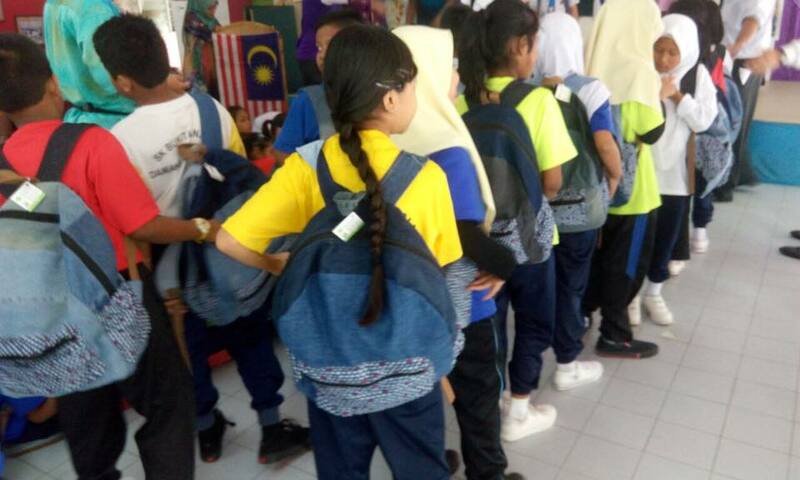 In fact recently, SURI was sponsored by EKUINAS CSR team in gifting SURI-made school bags to Sekolah Rendah Bukit Lanjan, a school for orang asli children in Damansara Perdana. When asked if she had any plans about expanding SURI outside of the Sg. Udang community, Sally said that there were interested voices among the orang asli community, so she’s contemplating branching out her business there eventually. But for now, especially with Amer moving on to finally finish his studies, SURI is Sally’s newborn third child and she will spend her time growing the existing 12 beneficiaries in Sg. Udang first.